Actuarily speaking, “the longer you live, the longer you’ll live.” Lou Matis, who has lived in Atherton for the past 47 years, is case in point. We thought we were celebrating something special when we attended Lou’s 100th birthday at Harry’s Hofbrau four years ago. But here we were again Tuesday night (Jan. 30) when Lou (far right, top photo) was being honored on his 104th birthday. We’re guessing that makes him the oldest Atherton resident — and maybe older than anyone else in Menlo Park, Portola Valley and Woodside (come on readers, prove me wrong!). As has been the case in past years, festivities were organized by Lou’s neighbor Doug Anderson (far left). And, as in years past, there was a lot of singing. Patty Harvey (pictured with Lou above) read a letter from Congresswoman Anna Eshoo saluting Lou for his many talents, including being a skilled carpenter and gardener, along with his love of automobiles. We thought our night was done when we saw a table whose diners all wore pointy hats. And then there was that 80th birthday balloon. 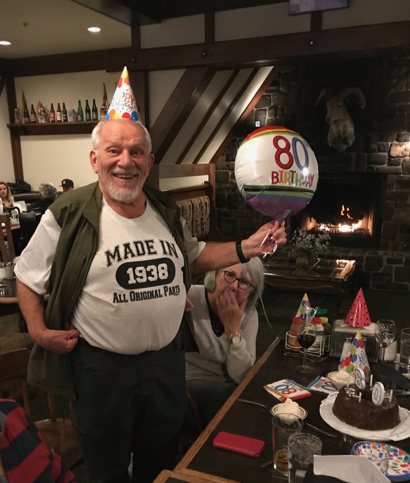 So we sauntered over to find Paul Lorton (pictured right above) was celebrating his 80th birthday in the company of his wife, his two Lorton brothers and spouses. What’s the Atherton connection? All three Lorton brothers attended Menlo-Atherton High School located in, yes, Atherton, California.